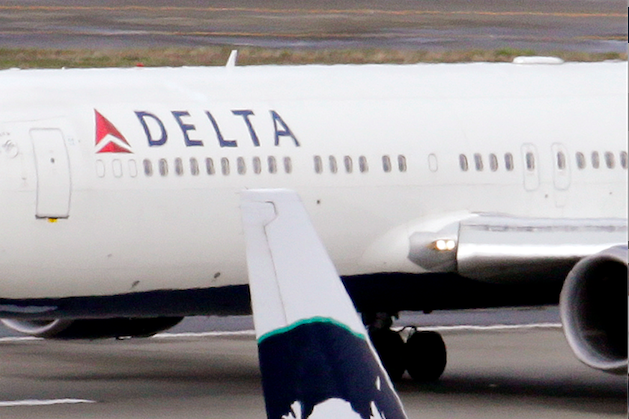 In this photo taken Tuesday, March 24, 2015, a Delta jet taxis past an Alaska Airlines jet at Seattle-Tacoma International Airport in SeaTac, Wash.
Life as a frequent flier can be stressful. Even with the perk of first-class seating, all of the stop-and-go commotion of commercial flights is still a pretty overbearing experience. In an effort to provide its top customers a travel experience typically reserved for the uber rich, Delta Airlines has launched a new program enabling "Diamond Medallion" frequent flyers to upgrade their flights to private jet accommodation, Bloomberg Business reports. The price tag to upgrade falls between $300 and $800, still pretty steep, but participants have the privilege of flying on board a Delta Private Jet that seats a few dozen passengers at most. Delta Private Jets marked its first upgrade flight on Friday with a quiet trip from Cincinnati to Atlanta aboard the Dassault Falcon 2000, part of Delta's 66-jet DPV fleet. The jet sports a bar, a DVD library, free WiFi and ample storage space in an interior with leather seats and gold trimmed belts. The program, conceived to overcome the "empty leg" problem of private jets traveling without passengers, will focus first on East Coast flights. The pricetag may deter some, but those who can afford it will enjoy a smooth experience free from the headache of commercial flight security procedures and boarding. To reach Delta's "Diamond Medallion" status, frequent flyers must accumulate 125,000 miles in travel and $15,000 in annual spending with the airline. At that point, the champagne is probably well deserved.